A new OECD report has identified cycling as one of the visible signs of a successful city. Although many cities have yet to adapt their infrastructures to accommodate the growing demand for cycle routes, others are finding inventive ways to bring the bike back to town. 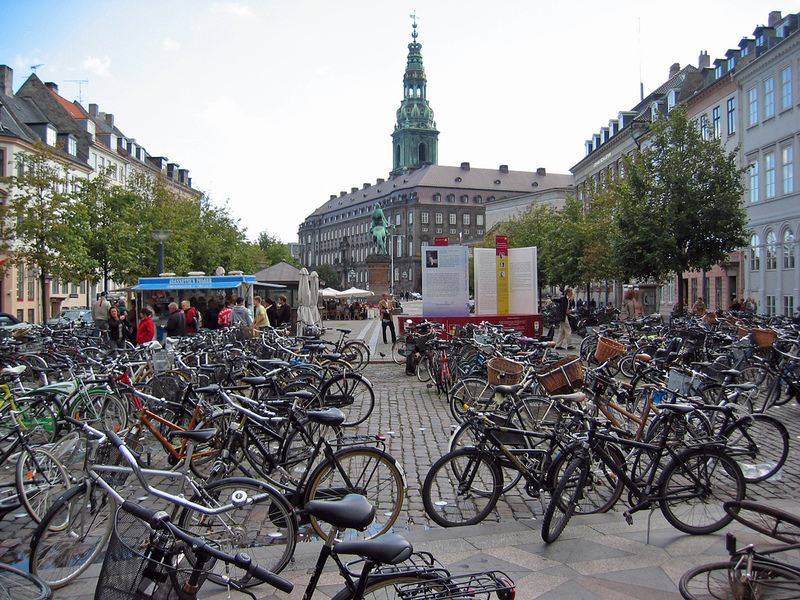 The Danish capital’s gold-plated credentials as a cycle-friendly metropolis are clear enough: 41% of its residents commute by bike, using over 1000km of bicycle lanes. With so many cyclists on the streets, Copenhagen has come to learn the value of keeping the traffic flowing. Which is why the city introduced “green waves”, electronic systems that coordinate traffic signals to recognise bikes instead of cars. Cyclists travelling at a speed of 20km/h find that they hit green lights all the way into the city in the morning, and back again at the evening rush hour. But Copenhagen isn’t resting on its saddle. The city is currently testing Green Wave 2.0, which will detect bicycle users approaching an intersection. If there are five or more cyclists together, the light will stay green until they pass. When it comes to cycling, London is no Copenhagen. Car-clogged streets make cycling in the UK capital difficult and dangerous. Even so, the number of bicycle journeys in London has doubled since 2000, and a 2013 cycling census found bikes making up around a quarter of rush-hour traffic in central London. That figure seems likely to rise further with the advent of two ‘cycle superhighways’. In February, Transport for London approved mayor Boris Johnson’s proposal for the new bike routes, which will run east-west, linking Barking to Acton across central London, and north-south between King’s Cross and Elephant and Castle. Dubbed ‘Crossrail for the bike’, the routes are intended to offer riders more protection from other road users, with segregated cycle lanes, improved junctions and dedicated traffic signals. The urban bike sharing concept had an unpromising start. When Amsterdam located 50 bikes for hire across the city in 1968, all of them were promptly stolen. But the idea was too good to die and today, from Dublin to Dubai, there are over 500 bike share schemes worldwide. Almost all such schemes rely on credit or debit card payments, which excludes those citizens who want to hire a bike, but don’t have a credit card or bank account. Arlington County, Virginia, just outside Washington, D.C., is trying something different to ensure more inclusive access to bike sharing. Residents who want to use its Capital Bikeshare programme will be able to pay cash for monthly memberships by visiting one of five ‘commuter stores’. To get started, applicants need only present proof of identification and residency and $16 in cash. When a customer’s account goes below $2, they’ll receive a reminder that they need to add more money to their account. The idea has also found favour elsewhere; during a visit to Jakarta, London’s mayor praised a similar scheme, and suggested it could work in London. But Boris Johnson doesn’t have to look as far as Indonesia or Mexico for a home-grown model: in Bristol, two roads in the city centre are closed to cars on one Sunday each month, as part of Mayor George Ferguson’s Make Sunday Special initiative. These ideas offer just a flavour of how forward-thinking cities are adapting to the needs of cyclists as part of wider sustainable development strategies. Other examples include Holland’s solar-powered bike lane, Tokyo’s subterranean bike parks and Manchester’s cycling community initiatives, among many more. And it’s becoming clear that local authorities don’t have to develop their own urban cycling concepts from scratch, but can, like Bristol, borrow from other cities and adapt ideas to their own circumstances. As far as urban cycling is concerned, innovating is worth imitating. The Idox Information Service can give you access to a wealth of further information on cycling and other transport topics, to find out more on how to become a member, contact us.